I speak to the Earth | Karmal Books online Christian books and media store. What if you could speak to the Earth beneath your feet and command it to release "Prosperity?" What if you discovered an ancient mystery concerning the Earth that can unlock God given destiny: What would you do? What if you could be restored to the place of Dominion that God gave Adam and Eve in the Garden of Eden: What would you do? What if I can show you how to overthrow every form of witchcraft or diabolical agenda against you...by unlocking the incredible power of an ancient biblical mystery: Would you jump on it? What if I can show you a proven spiritual prescription for "Healing the Land: " Would you take it? 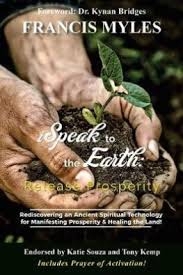 "iSpeak to the Earth: Release Prosperity" contains biblically based answers to all of the above questions. Its the book you cannot afford to not have in your library.